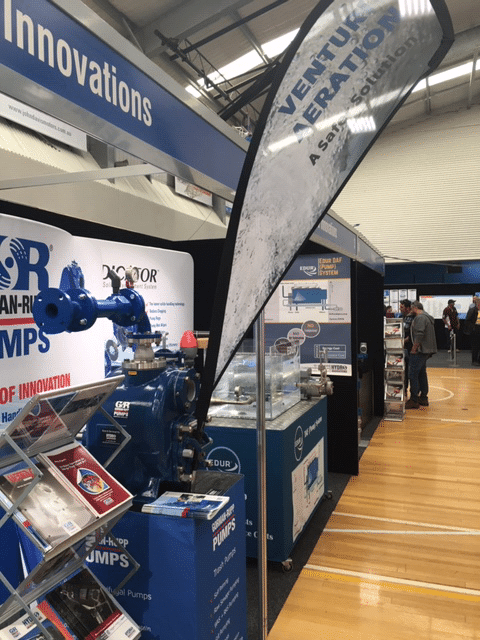 Hydro Innovations staff at the recent WIOA conference in Orange have reported excellent feedback from operators about their Venturi-Aerator units. Operators appreciated that the units are mounted on lagoon and basin banks rather than having to be in them. 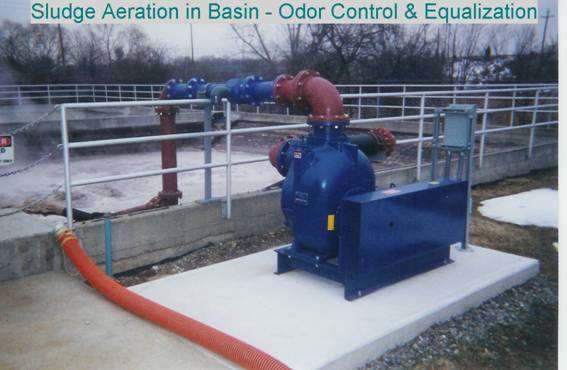 Venturi-Aerators are “driven” by Gorman-Rupp self priming pumps, which sit on basin banks to draw water from the basins, and “force” it through the Venturi-Aerators, accelerating the fluid and creating a venturi effect [vacuum], drawing in 2.2 times the air as the water being pumped. The water/air mixture then passes through the “mixing and oxidisation zone”, facilitating the removal of CO2 gas and reducing the size of volatile solids. The discharged wastewater is saturated with dissolved oxygen. Operators saw a great WHS benefits associated with using this technology compared with floating, surface mounted aerators. These technologies require the use of cranes or for operators to use boats to access them for maintenance, whereas the Venturi-Aerators and Gorman-Rupp pumps can be quickly and safely accessed. Asset owners do not have to be disadvantaged either, as these units can be as efficient [or more so] than other technologies. Standard Oxygen Transfer Efficiency [SOTE] can reach [and sometimes exceed] 1.86kgO2/kWh. Hydro Innovations staff look forward to discussing Venturi-Aeration with more operators during the course of the year.